Update: Check out my winning entry in DailyBuzz Style Top 9x9 here. Thank you DailyBuzz!!! it;s so glam rock !! those paisley jeans are awesome - love it! you did a great job styling the plain white tee!! I like the combination of jeans and jackets .. all style! ..
so chic - looove that jacket! I love your pants! Great job on on the styling challenge! Those jeans are so perfect paired with a white tee. Great outfit. Very cute. 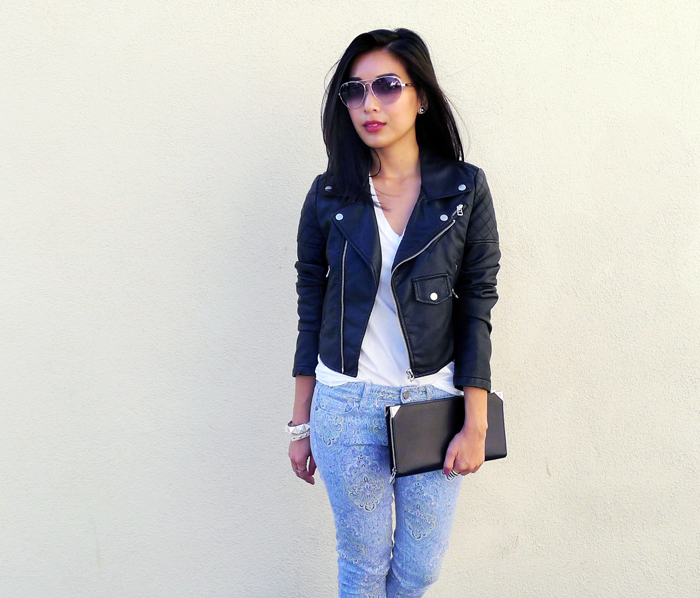 Love the feminine printed jeans with that kind of rough jacket! Great post! Plain white tees are awesome, there's so many different ways to dress them up. Love the way you've done it, the pants are so pretty! I absolutely love how you styled your tee! That Alexander Wang clutch is to die for! So glad that you went with that colour for the denim! So much better than the darker version. Such a great pairing.. The white tee really complements the jeans. i always dig a simple white tee and moto jacket! I love your casual but oh so stylish look! 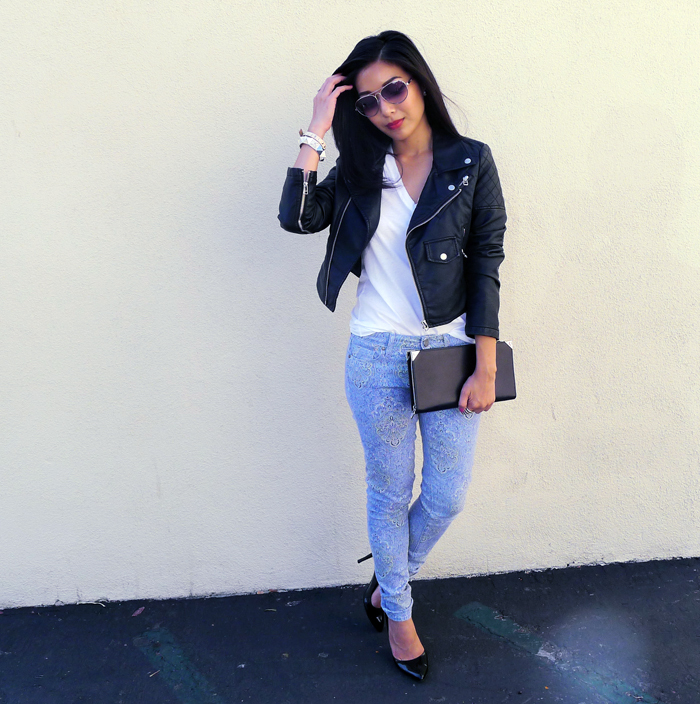 I'm loving all of these printed jeans I'm seeing on blogs lately! Love these! How I love their apparels here! Also,try checking out my fave site for: https://www.enviius.com >Gucci Handbags, Prada Handbags, Chanel Handbags, Burberry Handbags Sales! Love to shop here! Awesome looking dear, some really interesting and remarkable photos by some obviously extremely talented photographers, my personal favorite is the picture titles irrational bird.